Bearded Collies have long, medium-sized frames covered in shaggy coats that hang straight. Their wide, flat heads—nicely draped in long hair—have strong muzzles and long, hanging ears. Their round eyes have a warm expression, and their tails hang low. Their harsh, medium-length coats come in black, brown, blue or fawn, with possible white patches. 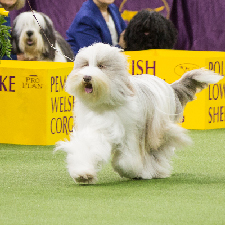 Overall, the Bearded Collie has a robust but endearing look. Bearded Collies are fun-loving pals around the house, always wagging their tails and looking for people to entertain. Slightly reserved, they may take some time to warm up when guests drop by. Beardies have loads of confidence and a great sense of humor. In fact, their cute faces alone are enough to make anyone smile. A warm and loving companion to children, Bearded Collies are also very protective of their environments. They have even been known to “herd” children to safety. While a little too friendly and outgoing to make good watchdogs, they will bark mightily if they sense danger. Beardies have very active and intelligent minds. They need an owner who provides consistent training and exposes them to new people and situations. This will make for a well-behaved and socialized Bearded Collie. Probably not the best choice for an apartment dog, Bearded Collies need a big fenced yard to run around in; however, a big yard is no substitute for family time: Beardies need lots of attention and interaction to maintain their amiable personalities. They have tons of energy and should be given at least one vigorous walk every day. Bearded Collies can live as long as 15 years. Generally healthy, some Beardies can develop hip dysplasia, hypothyroidism and eye problems. Also, check regularly for ticks—they can be hard to locate in that thick coat. Bearded Collies should be brushed every day. They also benefit from professional grooming. Bearded Collies originated in Scotland hundreds of years ago as faithful herding dogs. Some claim that they date back to the Roman occupation of Britain, but the earliest known record is actually the 18th century. The “Beardie,” which resembles the Old English Sheepdog, may have actually descended from the Komondors of Central Europe. Either way, the Bearded Collie has been an established and beloved canine, not to mention a formidable sheepherder, for many centuries.